There’s a growing list of Shostakovich Fourths in the catalogue, several of which I’ve reviewed on this site. What makes this DG double stand out is the prologue to Orango, a satirical opera commissioned – somewhat hastily – by Moscow’s Bolshoi Theatre to mark the 15th anniversary of the October Revolution. Originally the plan was for a new opera, The Solution, to a libretto by the poet Demyan Bedny. That never materialised, so Count Alexei Tolstoy and Alexander Starchakov were drafted in to help. 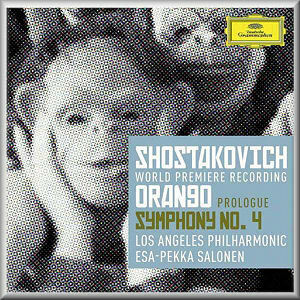 It was they who suggested Orango, for which Shostakovich produced a prologue; but then that project was shelved as well. In 2004 this piano score was discovered among the composer’s papers, and two years later his widow, Irina Antonovna Shostakovich, invited Gerard McBurney to produce a performing version of this 30-minute piece. It was an inspired choice, given the latter’s important work in reconstructing Hypothetically Murdered (1992). In Orango the aim was to flesh out the music using the bits Shostakovich had already plundered from his 1931 ballet The Bolt and orchestrate the rest as idiomatically as possible. The prologue was premiered five years later, and thank goodness someone at DG had the presence of mind to record it. Orango is a work steeped in the rich tradition of Russian satire, a genre that spawned some of Shostakovich’s most outrageous creations, from The Nose (1928) to Moscow Cheryomushki (1958). Conveniently it’s a celebratory piece, set on the steps of the capital’s grandiose but never-to-be-built Palace of the Soviets; it also ridicules the sycophantic press and prevailing public attitudes, which may explain – in part at least – why the opera was never completed. As for the central character, the humanoid ape Orango, this was a thinly disguised reference to the work of Soviet Professor Ilya Ivanov, a misguided scientist who attempted to cross-breed apes and humans. So much for the gist and genesis of this bizarre opera, but does the prologue work as a stand-alone piece? Emphatically, yes. The overture – with its skittish side drums and thwacking pratfalls – will be familiar from The Bolt, whose anti-Soviet sentiments are carried over into the opening number, ‘Work is a curse/The unhappy destiny of a slave’. It’s gloriously sung by the revellers and The Voice from the Crowd, Jordan Bisch. This is vintage Shostakovich, big, bold and biting, the fine soloists and chorus believably balanced; even more impressive is the recording, which is astonishing in its reach and impact. The sound is very refined too – not a hint of Soviet-era rudery or roughness – and yet it captures the work’s dystopian flavour to perfection. The bass-baritone Ryan McKinny makes a splendidly sardonic Master of Ceremonies – in this context more of a carnival barker – who announces Orango and sings lustily of the country’s economic miracles. The pomp-pricking accompaniment tells its own story though, Salonen drawing strong, characterful playing from his orchestra. And that’s another surprise, for this conductor has always struck me as somewhat aloof and cerebral, and not one to slum it; but slum it he does, The Bolt-borrowed dance of Nastya Terpsikhorova – ‘the embodiment of music’ – played with a blend of mock seriousness and savage delight. It’s great fun, and to hear it played and recorded this well adds immeasurably to one’s enjoyment of the score. Indeed, it was all I could do to stop myself leaping up and shouting ‘Bravo’ after Nastya’s roof-raising number. The Foreigners, who act as a Greek chorus, condemn the show as drivel, to which Shostakovich replies with music of appropriate zest and bombast. The Zoologist – the man of science, much revered by the Soviets – introduces Orango as the brute who is able to yawn and use a knife and fork. It’s dark, seditious stuff, and one can imagine how it appealed to the composer’s sense of mischief and subversive wit. McBurney’s orchestration sounds remarkably authentic, and despite a wide array of instruments – including military and slide whistles, sleigh bells, castanets, motor horn and flexatone – he deploys them all with commendable restraint. Indeed, the satire seems all the more telling when – as here – it’s so artfully done. As for Orango, he’s part of a long literary line that stretches from Mary Shelley’s Frankenstein to Gaston Leroux’s tortured Fantôme and beyond; he has a rudimentary aesthetic sense – he can play a well-known nursery rhyme – and he’s powerfully attracted to one of the foreigners, the ‘Rrrrrrrred-headed temptress’ Susanna. The fricative frolics that follow are an absolute delight; as for Eugene Brancoveanu and Yulia Van Doren, they’re funny without resorting to grotesquerie. McBurney and Salonen exercise good judgment with this intriguing score, even if the outlandish plot becomes more fragmented and improbable by the minute. Still, there’s enough entertainment value and interest in these characters to keep one listening to the end. That’s helped by singers – and a chorus – who clearly relish their roles and sing with verve and accuracy. And what a thrilling finale, the audience responding enthusiastically to a job well done. It’s tempting to speculate what the completed work might have been like, but at least we have a fine realisation of the prologue that’s not likely to be topped any time soon. That goes for the recording too; it’s one of the best DG offerings I’ve heard in ages. Salonen may have the field to himself with Orango, but there’s plenty of competition where the Fourth Symphony is concerned. Apart from legendary recordings by Kirill Kondrashin – Moscow, Dresden and Amsterdam – the field has become even more interesting with recent and revelatory accounts from Mark Wigglesworth (review) and Daniel Raiskin (review). Both are exemplary recordings as well, and if Orango is anything to go by this LA version is likely to be equally impressive. So it proves, although it soon becomes clear that Salonen’s reading of the symphony is frankly mediocre. True, the first movement has huge breadth and richness, the telling details of the score superbly caught in a very natural acoustic; but despite its vehemence and clatter the first cataclysm – and those that follow – are much too rhetorical to be convincing. Salonen certainly lets the music breathe, but Wigglesworth does the same without sacrificing essential heat and angst. That said, it’s well played and boasts remarkable presence – the low brass is especially tangible, the scurrying strings supremely well focused – but dramatically this performance falls well short of the mark. Anyone weaned on the Soviet-era sonics and strident playing styles of recordings by Rozhdestvensky, Kondrashin et al will know just how those elements energise their performances. Raiskin and his Rhenish band are perhaps closer to that sound, but Wigglesworth has proved – decisively – that this music can be played in a refined and elegant way without losing its essential ambiguity and edge. Salonen does a bit better in the central movement, but if you prefer a more forensic approach his reading will seem much too random and ephemeral to engage you for long. More’s the pity, given that the Disney hall and DG’s engineers have conspired to produce such spectacular sound. Regrettably, the Largo is just as flabby and unfocused. Again one has to marvel at the orchestra’s precision and polish, but when it comes to the work’s connective tissue and its inner conflicts – those dark, irreconcilable tensions, for instance – this Fourth is nowhere near as brutal or compelling as the best. That said, this set is priced as a single CD, so it would still make sense if one were to keep the first CD and ditch the second. And while I’m being so dyspeptic, I do wish DG wouldn’t print their booklets on such flimsy paper and in such small, grey type. BIS and others do a far better job in this department. Worth it for Orango alone; look elsewhere for the symphony.